The Pacific sand lance (Ammodytes hexapterus) is a slender fish that buries itself into sediment and feeds primarily on copepods. A study led by Dr. Douglas Bertram at Canada's Institute of Ocean Sciences analyzed the intestinal contents of 20 sand lance collected from Sidney Channel between 2013 and 2015. Of those fish, 85% had ingested plastic filaments. The average length of these filaments was 2.14 millimeters and there were 1 to 63 pieces found per fish. Bertram presented the findings at the 2016 Salish Sea Ecosystem Conference last spring in Vancouver, B.C. The plastic filaments found in the sand lance were small enough that they did not directly kill the fish. However, the prevalence of ingested plastic is a problem for a number of reasons. In some cases, plastic filaments can entangle organs or become too large to pass. They can also lower the amount of nutritious food a fish reaps from its efforts. High amounts of plastic ingestion by fish could also affect birds due to what is known as bioaccumulation. Many types of plastic can leach toxic chemicals. If large amounts of toxic filaments are ingested, these chemicals can get incorporated into fish muscle tissue. The amount absorbed would likely be too small to kill or overtly harm fish. However, if a particular species of bird gets much of its diet from these tainted fish, the concentration of toxic elements will be magnified. 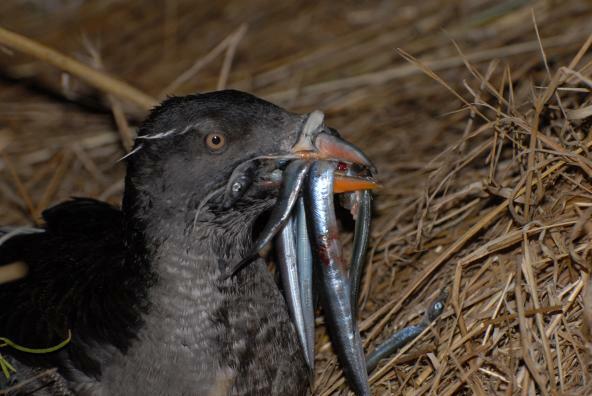 Several species of seabirds, including rhinocerous auklets and marbeled murrelets regularly feed on sand lance. The Sidney Channel collection site is designated as an Important Bird Area by Birdlife International. The source of the plastic found in the fish was unclear. Such microplastics — synthetic polymers less than 5 millimeters in size — are found ocean-wide, but Bertram suspects that there may also be a local source that accounts for the high levels in sand lance. It is also not known if sand lance are ingesting the plastic directly, mistaking it for food such as copepods or other zooplankton. View Dr. Bertram's presentation at the 2016 Salish Sea Ecosystem Conference. Dalana Dailey is an environmental science major at the University of Washington Tacoma. She is currently the managing editor for the Tacoma Ledger.